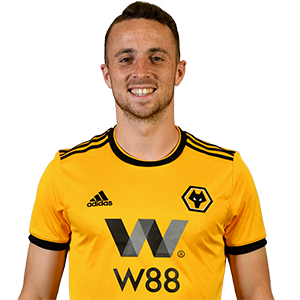 Diogo Jota was Wolves’ top scorer in his debut season at Molineux, netting 18 times to help the club to promotion. The forward originally joined Wolves on loan from Atletico Madrid and made his move permanent following an impressive campaign. The attacking midfielder, who can play both wide or centrally, has played for Portugal at Under-21 level. Similar to Ruben Neves and Willy Boly, Jota joined having worked with Nuno Espirito Santo at FC Porto. The youngster began his career at Pacos Ferreira and joined Atletico on a five-year deal in 2016. He then spent a season on loan at Porto, scoring nine goals in 35 appearances, including in the Champions League, prior to the Wolves move. In the Premier League, the Portuguese enjoyed his finest hour against Leicester City, netting a hat-trick in Wolves' 4-3 win.